Long John Silvers: B1G1 Free Fish Basket Coupon! 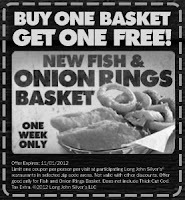 Head over here to print a B1G1 free Fish & Onion Rings Basket from Long John Silvers! Coupon expires 11/1/12.